The concept of a "filling" refers to the restoration of a tooth that is damaged due to decay or fracture. This is called a "direct restoration" because the material is placed directly on the prepared tooth. In our office, we place composite resin fillings, which are tooth colored restorations placed with a dental adhesive (bonding). The process for restoring a decayed tooth can be straightforward. The tooth is anesthetized so that there is no discomfort. The decay is removed and the preparation is cleaned. The composite is then placed into the preparation and cured. The result is a strong and healthy restoration and can be indistinguishable from the natural health teeth! Bonding is a technique that utilizes the same material used for composite fillings, but is for esthetic purposes. Bonding can be used to correct chipped, broken, misshapen, worn, slightly crooked teeth, or teeth displaying small gaps. Unlike veneers and crowns, bonding your teeth with resin composite is a single appointment procedure. First, teeth are roughened to produce an ideal surface with which to bond the material. A conditioning gel is applied. A tooth-colored material called resin is then placed on the teeth and is sculpted to the desired shape. 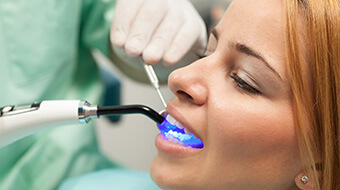 A harmless ultra violet light hardens the resin, bonding it to the teeth. Once in place, bonded restorations are very strong. Bonding can greatly improve the appearance of your teeth, resulting in a more beautiful, natural looking smile! Often bonding can be used along with veneers, dental implants, Invisalign, or whitening to creatively change the appearance of the teeth.